Fremont, CA, June 5, 2017 – CLEARink Displays proudly announced that its Video-Capable ePaper Display won the prestigious Best in Show Award, at the Society for Information Display’s (SID) annual DisplayWeek tradeshow in Los Angeles on May 24th, 2017. SID’s Best in Show awards honor the most significant advances in display technology and systems, products, prototypes and manufacturing processes presented by exhibitors at DisplayWeek. Winners are chosen for their ability to generate excitement within the display industry, along with the general public, global media and analyst communities. This year's winners were selected from more than 200 exhibitors. "This is one of the most prestigious awards in the display industry globally, a panel of distinguished judges pick the best in show winners among thousands of product demos by over 200 companies." Said Dr. Yong-Seog Kim, President of SID. "On behalf of SID, I congratulate CLEARink Displays for creating its video-capable electronic paper display that is quite unique in the market." "We are overjoyed to receive this honor from the industry's most respected organization." said Frank Christiaens, CEO of CLEARink Displays. "On behalf of our small but talented startup team, I wish to thank SID for this honor. We are now even more determined to change the world of displays with our unique technology. Finally I would also like to thank our strategic partners Merck KGaA from Germany, and Suzhou Jinfu from China, without whom this would not have been possible." CLEARink has commenced manufacturing trials in a large LCD plant in Asia and expects to have samples in the next few months. The 54th SID International Symposium, Seminar and Exhibition, or Display Week 2017, took place May 21-26 at the Los Angeles Convention Center in Los Angeles, Calif. Display Week is the premier gathering of system integrators, designers, consumers, scientists, engineers and manufacturers in the field of electronic information displays. 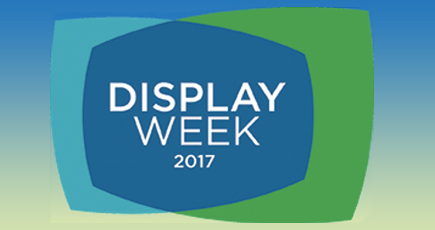 For more information on Display Week 2017, visit www.displayweek.org or follow us on LinkedIn, Facebook and Twitter @DisplayWeek. The Society for Information Display (SID) is the only professional organization focused on the display industry. In fact, by exclusively focusing on the advancement of electronic display technology, SID provides a unique platform for industry collaboration, communication and training in all related technologies while showcasing the industry's best new products. The organization's members are professionals in technical and business disciplines that relate to display research, design, manufacturing, applications, marketing and sales. To promote industry and academic technology development while also educating consumers on the importance of displays, SID hosts more than 10 conferences a year, including Display Week, which brings industry and academia all under one roof to showcase technology that will shape the future. SID's global headquarters are located at 1475 S. Bascom Ave., Ste. 114, Campbell, CA95008. For more information, visit www.sid.org.